I had several topics run through my mind in the last week that I could have written on, but in the end, I decided on book signings. 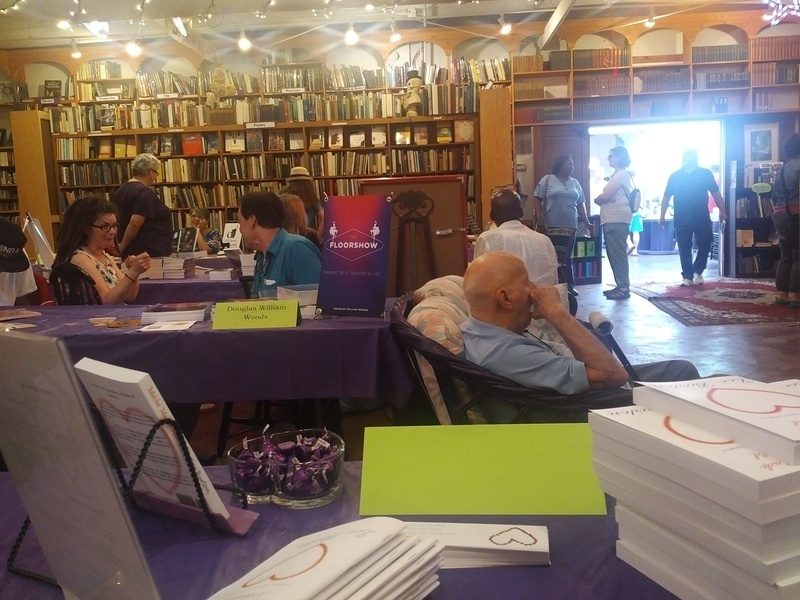 I attended an incredible, fun event this past Saturday called Author Alley. 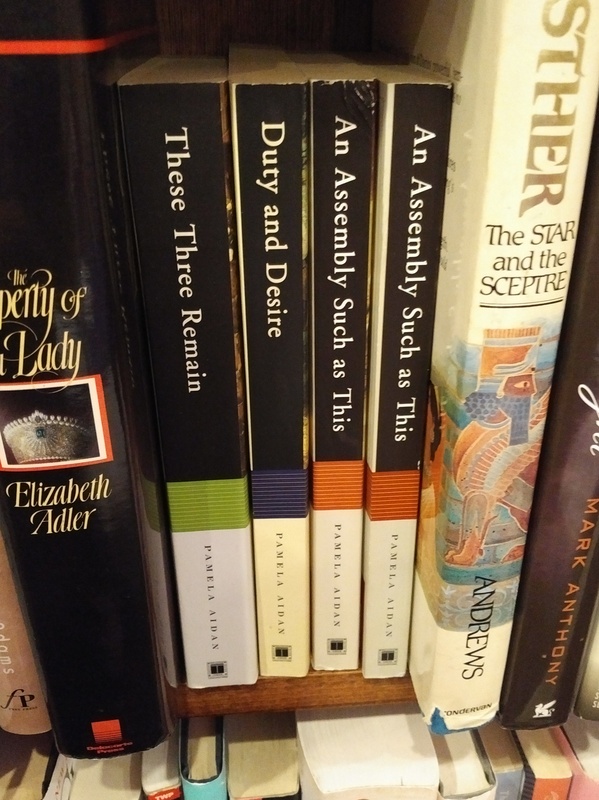 I sat at a long table, in front of a shelf containing three or four of Pamela Aidan’s JAFF works, and between two other wonderful NorthEast Ohio authors. On my right was a gentleman named John Bruening, who has written a pulp-fiction type book called The Midnight Guardian: Hour of Darkness. On the other side was the lovely Andrea Dyan Campbell, who wrote a moving memoir of her struggle with cancer, called The Beautiful Journey. 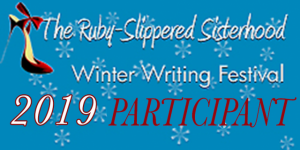 Both of these authors, and the others that I met, were friendly and obliging, and eager to speak about their books and the craft and process of writing. Both Andrea and John were promoting their first ever books…and there I was with something like 14 titles to my name! Everyone who asked me if Matches Made at Netherfield was my first book was shocked to hear how many titles I have. My view of the room and some of the other authors. Not only were the other authors welcoming, their books were varied, too. There were romance authors…myself and two of my fellow NEORWA members (Marin McGinnis and Nancy Loyan) and a couple other people…but there were people who had written mysteries, and about different aspects of Cleveland’s history (Author Alley is held at Loganberry Books in the Shaker Heights area of Cleveland), Ohio’s history, and a host of other things. Though I did not have a chance to look at many of the other displays, I would say that a reader could probably find at least one book there that interested him. What did I take away from this experience? Well, I know for sure I would like to do it again, despite the fact that I only sold one book, and that was to the bookstore. 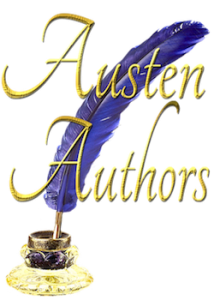 I enjoyed talking with the other authors, and was even able to give one gentleman what amounted to a quick workshop on Amazon ads. 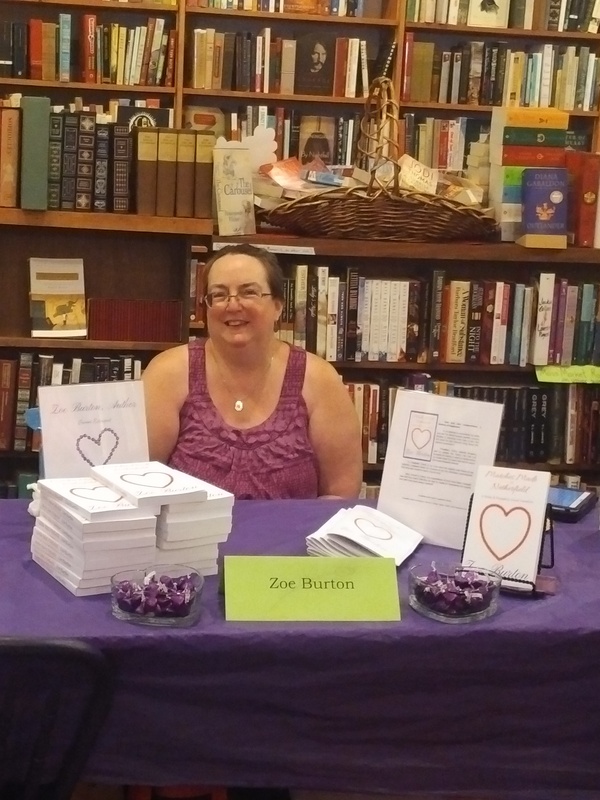 I was more than happy to explain what it is that I write and talk about my book to the few people who stopped at my display, despite the fact that I am an introvert and am uncomfortable with selling things and speaking to strangers. I was impressed with the support for local authors that I found, not only from the bookstore but also from the people who circulated through the displays. I learned a lot, too, from listening to the other authors and from visiting the few displays that I did. Next time, I will not spend money and time on teaser booklets. I’ll make cards up…postcards…with the book information and maybe a link or something on them. I won’t buy so much candy…it might be because we had to have the event inside due to the weather forecast calling for rain, but there were fewer people than I expected and therefore fewer people snagging goodies. I’ll know next time that I don’t need my table covers…Loganberry provided very nice purple table covers. How fortuitous that they matched my display! 😉 Oh, and I saw two or three people with large displays….not sure what to call them. John to my right had a 16” x 24” (or thereabouts) display that was essentially his book cover. He set it on a little stand on top of the bookshelf behind us. I thought it was very nice, and so I think I’m going to try to emulate that.